The spherical forms are influenced by the reactive effect of heated chemicals. 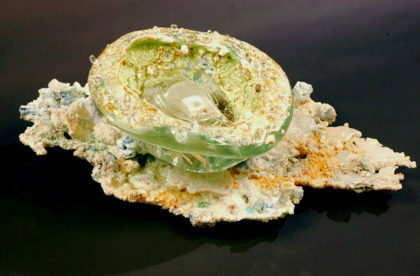 By trapping ceramic glazes into molten glass, the hot salts release a gas that provides enough pressure to blow a bubble. 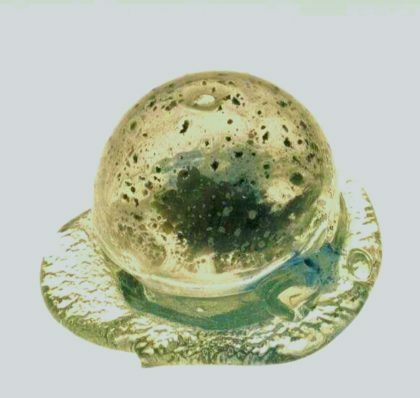 The resulting form is a hollow orb with exploded powder bouncing around the interior. When the gases remain trapped, they deposit a dark metallic smoke. Escape holes are melted into some pieces to allow fumes to escape. This results in a clear sparkling dome that can be peered into. Dried ceramic glazes are poured into a blown glass vessel during the puntied phase of the blowing process. 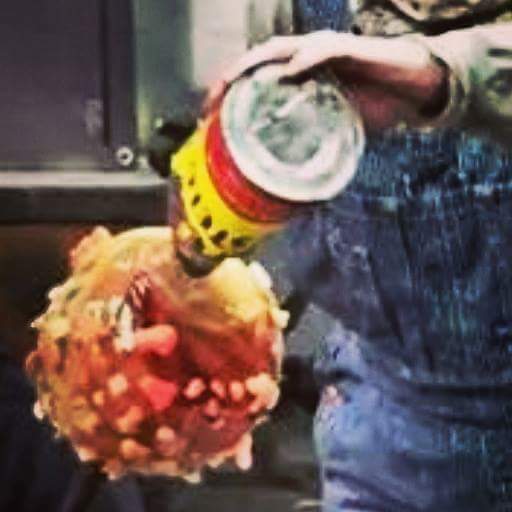 As they are introduced into the glory hole, glazes will crackle, bubble, web, or fuse. One of the characteristic of Rockriver's approach is that she find interest out the outskirts of he medium. It was the encorporation of kiln residue that put her work in the context of its creation. Rockriver was able to break away from the vessel and clearly show her works are geological spaces. "The works Sally creates can leave us feeling as if we have actually traveled into the unknown to find glass that remains after an eruption. Perhaps we will find a carbon bubble frozen in time, or jewels encrusted along a volcanic crater. Rockriver's art allows us to live in a beautiful world that is much more exotic than our own.We become aware that sudden forces instantly transform the landscapes of planets in faraway galaxies, just as it happened on Earth. She makes us realize, that somewhere, if a hot meteor hit solid silica ground, the heated surface could burst into tendrils of glass that explode from a newly created hole."